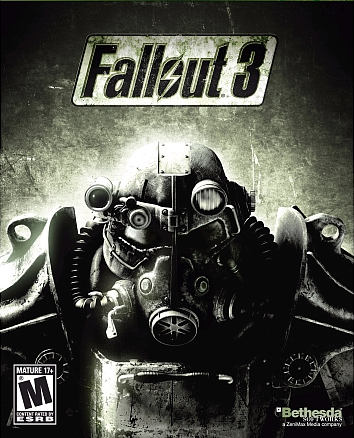 I picked up Fallout 3 late into its lifespan. As in, it had been months since the last DLC (Mothership Zeta) was released. I had always wanted to play it, but was torn between my back log of games and waiting for a Game of the Year edition. When the lull in my catalogue finally came around and there was no GotY edition, I went ahead and bought the standard copy. I loved the first two and was very interested in Bethesda’s take on the classic series. I was wary going into Fallout 3 because a week earlier I had purchased Elder Scrolls 4: Oblivion. I returned it two days later. I wasn't a fan of the first person and overall bland experience. Seeing Fallout portrayed the same way, I was nervous. After a half hour of tooling around in game, I was incredibly pleased. The controls were spot on and the Pip boy interface was everything it needed to be. The only issue was I switched to a third person view. Movement was poorly animated and it looked like my character was ice skating across the wastes. This is a minor issue though, as the game is clearly meant to be played from the first person perspective. Bethesda made the right move by turning this series into a FPS. While Interplay's first two entries were iconic, I always had a hard time immersing myself with the pulled back camera. With this new perspective, it's easier to believe that you are the wanderer. The wastes of the DC area feel appropriately barren and deserted. From the rocky hillsides to the bombed out metropolitan center of DC, the world feels spectacularly dystopian. Thrown in are a few whimsical nods to an ideal 50s US that complete an overall superb new take on this post apocalyptic RPG. When playing a RPG, I get my kicks from the character interaction. Charisma/ persuasion are usually my strongest stats. I love seeing alternate solutions that don't force me to pull out my gun. Fallout 3 does this to a level seldom seen in games. Nearly every quest has multiple solutions. Most are filled with an empty good/evil scenario that has no real bearing overall. In Fallout, my decisions carried a lot more weight. This is dialogue/quest writing at its finest. Further, there is a nearly overwhelming abundance of quests to be done in addition to the main story. I easily spent 15 hours just traversing the wastes taking care of side quests for NPCs before picking up the main story outside of the vault. My only gripe, and it's a large one, is the ending of the game. I had the option to do things differently, but it was written that I only had the one choice initially. DLC changed the ending, but there should have been more options, including the obvious one that had me furious because I couldn't pick it. In short, don't let my super mutant buddy do something once and not again 45 minutes later. It was during these travels that I hit the level cap with ease. It's set at 20, with DLC raising it to 30. There is such an abundance of things to do, that I hadn't even touched some quest lines before I hit the cap. Part of what made this possible was the strong combat system. The VATS system is carried over from the first two entries and plays quite the same. It is just as vital in taking down enemies quicker and saving you much needed ammo. Shockingly enough, the animation that plays with each shot never gets old. How they accomplished that, I will never know. There is a pitfall to combat though. It wreaks havoc on your equipment. Your weapons and armor are absolutely essential to your survival and each encounter deteriorates them. To keep them from breaking completely, you must scavenge what you can to make repairs. This is a giant pain as you're forced to carry loads of extra gear to make repairs on the items you do use. What breathes life into the wasteland is the cast of characters you meet along the way. From your character's father to your super mutant friends, each character has personality. There is much to explore in the interactions made throughout the game. The drawback is that nearly all of the character models are hideous. The women have mustaches and everyone shares a vacant gaze. One character rises above them all though, Three Dog. Bethesda took a page from Square Enix's guide on how to make annoying characters (see Lucrecia, Genesis). What makes him especially unbearable is that he runs the radio station heard for most of the game. Unless you want to travel the wastes with the sound of the wind as your soundtrack, you're stuck with Three Dog. He loops the same stories based on how far you've progressed in the game. His voice is simply unbearable. I really wish I had the option to kill him with no ill effects to my character. From the moment you're born, Fallout 3 is a well played game. The story is slightly predictable, but engaging. There's plenty to do and plenty of ways to do it. Now you even have the option to buy the game with all DLC included for half of what others have.